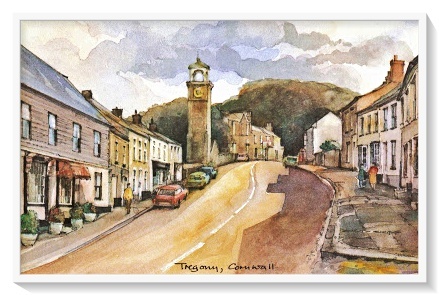 "Tregony was once a busy port, with the right to send two Members of Parliament to Westminster. The tin mines and china clay pits, however, were the cause of their own destruction as silt clogged the River Fal. Despite Acts of Parliament aimed at stopping mining, the waters receded leaving the highest navigable point over four miles away." To see Tregony today it is hard to believe it was once a busy port - but time moves on. I have a few photos of the village. There are some interesting buildings. The clock tower, for example, is from the 1833. There is a strange story that it was sold to an Australian gentleman in 1851. However, the Mayor at the time stepped in to prevent the sale by buying the clock himself - and eventually he sold it back to the people of the village. ... and a row of Poor Houses from the 19th century. Oh, and a church, of course! St. Cuby's. The church is a mixture of 12th, 14th and 15th century architecture but was partly rebuilt and lengthened in 1828. Monday was a wonderful day, with blue sky and sunshine, supposedly one of the hottest February days on record. So we went along to The Lost Gardens of Heligan - again - and I snapped a few photos as we walked. Starting off with the rhododendrons. A few sacks of mushrooms were hidden away from the daylight and looked very tempting. The Head Gardeners Office was snug and warm with a real log fire burning away. This is how it would have looked prior to 1914. More territory awaiting planting, this will be full of flowers in the summer months. The Sundial garden could also do with some colour - always looks special during the summer months. And then we head off to the green, green fields of Heligan. More greenery but many of the trees are still without leaves at the present time. ... more water in the jungle! A few goldfish spotted in the depths. And now it's snooze time, at least for the pigs. Finally, back to the rhododendrons. The Lost Gardens of Heligan cover some 200 acres so there is much to discover. Following on from my Padstow Post - of the 24th of February - a few random photos as I walked round the town. ... the ghost who haunts Abbey House is said to be an Elizabethan lady. She is sad and alone and is often seen ascending the 15th century granite stairway from the cellar, as she silently makes her way along a passage which forms the oldest part of the house. ... and, if you are in Cornwall, there also has to be a Cornish Pasty shop. The next photo is the Golden Lion pub and it "dates back to the 14th century and is the oldest inn in Padstow." Now we have Anchor Cottage, which is very difficult to miss - because of its bright colour. The houses below face each other so you wouldn't want to fall out with the neighbours opposite. But there is somewhere to dry the washing. And that's about the end. These gravestones date from the early. 1830s. A Sunday walk yesterday included Charlestown, Cornwall, as per the photos. A pleasant sunny day for February, though a little hazy first thing. Photo above is looking across to the Pier House (restaurant, bar and accommodation). And now, in the photo above, looking eastwards. The building with the pointed top, to the right of the picture, is often shown in the Poldark television series. A few of the tall ships, often in dock at Charlestown, can be seen below. The old harbour wall has steps leading down to the water, which had a greenish tint. Two more photos. First the Coast Path sign and finally the small bridge across the harbour. This photo was taken prior to the others. As can be seen, there was still a haze prior to the sun breaking through. We were in Padstow on Thursday and what a lovely day it was: blue sky and sunshine. Padstow, a small town and fishing port, is on Cornwall's north coast. It's history stretches way back. It is said that the Vikings raided the area in 981. Padstow is recorded in the Domesday Book of 1068. Today it's a busy place for tourism. Some of this comes from the restaurateur Rick Stein - visitors seem to want to travel great distances to have a meal in his restaurant or cafes. We walked around the harbour and then on to the coastal path. Lots of people about - partly because it was half term in Cornish schools. The coastal path though had lots of elbow room! Padstow is situated on the west bank of the River Camel Estuary. When the tide is out there are huge stretches of naturally occurring granular material - sand in other words. The name of the River Camel is derived from the Cornish Language Dowr Kammel, which means a crooked river. The coast path winds its way alongside the estuary, with lovely views. On the hillside there's a farm - what a great position. The path goes on and on for miles and miles but we only walked for about an hour - and then retraced our steps back to Padstow. Today's photos, taken at different times, are of Truro Cathedral, which dominates the Truro skyline. The photo above was a lucky shot. I was hoping that the rainbow would settle on the cathedral, but it wasn't to be. The cathedral is, by cathedral standards quite recent. Building started in 1880 and was completed by 1910. The building is quoted as being a triumph of Gothic Revival Architecture. For the full cathedral story go to Cathedral's website. The cathedral is one of only three cathedrals in the UK with three spires. The narrow roads by the cathedral make photos a little difficult, but the magnificent interior more than makes up for this. Unlike many cathedrals nowadays entry is still free which, of course, is as it should be. Wonderful carvings abound on the walls. If you are ever visiting Truro pop into the Cathedral of the Blessed Virgin Mary. You won't be disappointed! On Wednesday I mentioned a visit to Mousehole prior to heading for the Minack Theatre. Here are a few photos I took at the time. The first mention of the village was around 1280. Old records show that pilchards were exported from Mousehole to France in the early 1300s. The village, by the way, is pronounced as 'Mowzel'. It is said that the last native speaker of the Cornish language, Dolly Pentreath, lived in Mousehole. She died in 1777. The harbour and village, with its narrow cobbled lanes, are a delight to visit. Dylan Thomas described Mousehole as "the loveliest village in England." History shows that Mousehole was invaded by the Spanish in 1595, when all but one of the houses was burnt to the ground. But it's quite safe to visit now!